The Methodist Church in Shepshed, Leicestershire, is in Field Street and is the subject of an article in My Wesleyan Methodists. Until 1969 both the Wesleyan and Primitive chapels were still in use, but no war memorials or rolls of honour now survive. There is a village war memorial. Two simple memorial plaques to a pair of brothers may still be seen in the church, and they tell a story which puts most official remembrance into context. The Manderfields were a Methodist family in the twentieth century, but Douglas and Mary Ann Manderfield’s children were baptised in the parish church. Their son Lakin (his mother’s maiden name) was born on 7th July 1895 and baptised on 21st September 1898. In 1911 he was working as a brickmaker. According to his service record he enlisted on 31st August 1914, and served as a Private in the 7th Battalion of the Leicestershire Regiment. He went to France on 29th July 1915, and served there until he was discharged on the 27th February 1918. He was awarded the Silver War Badge on 5th March 1918, meaning that he had been wounded. After the war had ended he married twice. His daughter, Dorothy May, was baptised at Field Street Wesleyan on 18th July 1921. He died in 1923 and, as can be seen from the first plaque, his parents were in no doubt that his death was caused by shell shock. Lakin’s younger brother, Claude Vincent, was born on 25th August 1899 and baptised in the parish church on 9th September 1903. He served with the 8th Battalion, King’s Own (Royal Lancashire Regiment), was wounded and sent back to St. Albans, where he died on 12th September 1918. He was apparently buried in Shepshed. It is unusual to see the words “shell shock” on a memorial, and the reason we see it here is as a dignified response to official indifference. 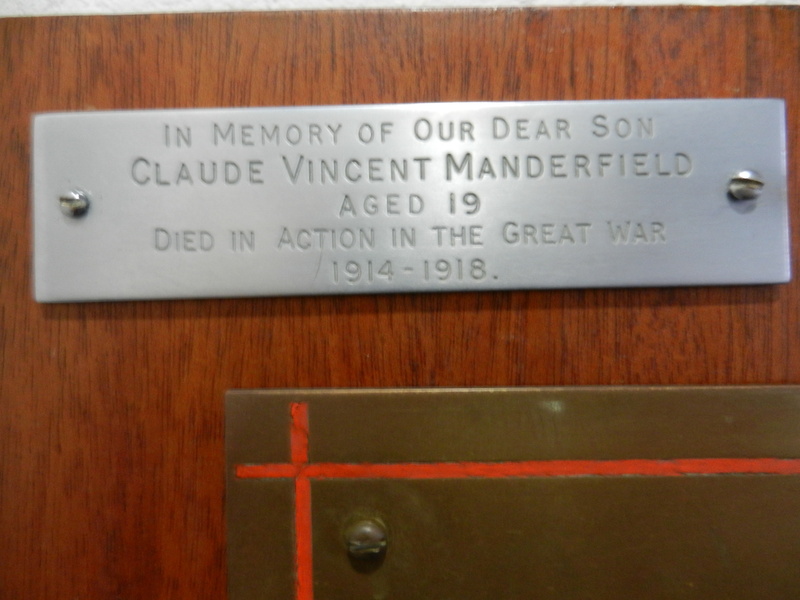 Claude Vincent Manderfield served in France for a short time, died of wounds, and is commemorated on the Shepshed war memorial and is recognised as a casualty of the war by the Commonwealth War Graves Commission. His elder brother, Lakin, enlisted in the earliest days of the war, served in France for two and a half years, was so severely wounded that he had to be discharged, and received a medal in recognition: but because he died at home, after the war, despite this being a result of his war service, all that service was not seen as worthy of a place on the war memorial, or recognition by the Commonwealth War Graves Commission. 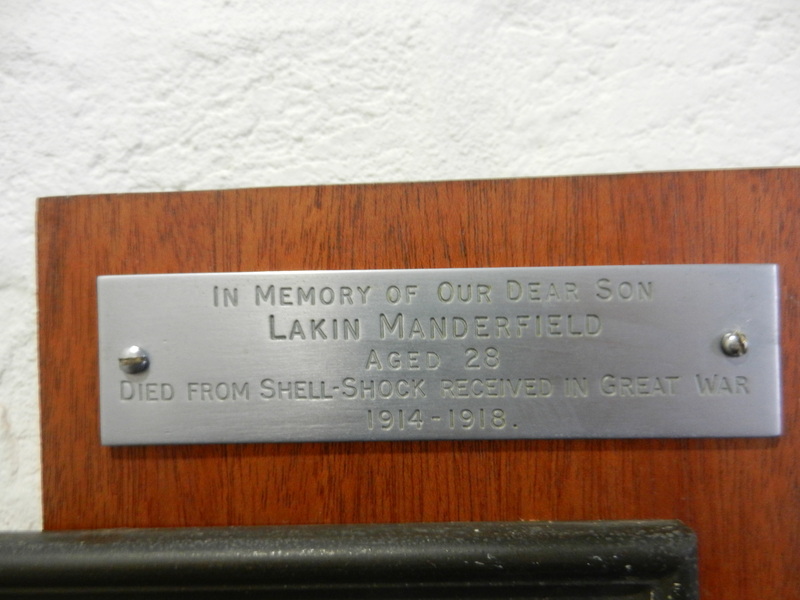 Ironically, Lakin’s posthumous son Lakin William Vincent Manderfield is recorded on the war memorial and by the Commonwealth War Graves Commission. He was killed during an air raid on Liverpool in 1943 whist in uniform. One small plaque, but it tells us much about the narrow focus of remembrance in our country.